Rogelio Martinez was selected as the first ever Mid Career Fellow at the Lark. A partial list of recent work includes WANAMAKER’S PURSUIT (commissioned and produced by the Arden Theater Co.), WHEN TANG MET LAIKA (Denver Center Theater Co/Sloan Grant. ), FIZZ (NEA/ TCG Grant/Besch Solinger Productions at the Ohio Theatre, New Theater Miami), ALL EYES AND EARS (INTAR at Theater Row), LEARNING CURVE (Smith and Krauss New Playwrights: Best Plays of 2005/ Besch Solinger Productions at Theater Row), I REGRET SHE’S MADE OF SUGAR (Princess Grace Award), ARRIVALS AND DEPARTURES (Summer Play Festival), UNION CITY… (starred Rosie Perez, E.S.T, winner of the James Hammerstein Award), DISPLACED (Marin Theater Co.). In addition, Rogelio’s work has been developed and presented at the Public Theater, Oregon Shakespeare Festival, Mark Taper Forum, South Coast Repertory, and the Magic Theater, among others. Rogelio is an alumnus of New Dramatists and his plays are published by Broadway Play Publishing. He has received commissions from the Atlantic Theater Company, the Arden Theater Company, Denver Center Theater, and South Coast Repertory. Rogelio has been profiled in a cover story in American Theater magazine. 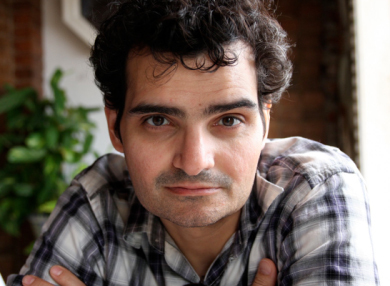 Along with writing, Rogelio teaches playwriting at Goddard College, Montclair University, and Primary Stages. He is a member of the Dorothy Strelsin New American Writer’s Group at Primary Stages and the Playwrights Workshop at the Lark. Rogelio was born in Cuba and arrived in this country in 1980 during the Mariel boatlift.